Now in it's 18th year, this gathering manages every year to bring together some of Oklahoma's finest musicians. This year has proven no different. Scheduled to perform are the Oklahoma Red Dirt legends the Red Dirt Rangers (who help to organize and perform), Grammy nominee John Fullbright, and the amazingly talented John Moreland. However, if years past are any indication, you can count on appearances by a number of Oklahoma's finest artists. 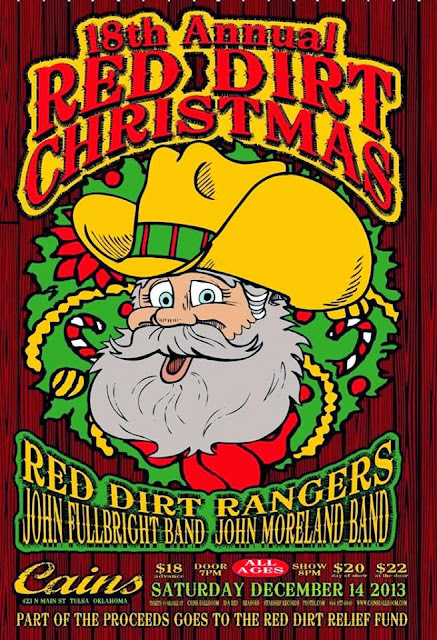 The Red Dirt Christmas is not only a time for friends and family to share a little music and kick off the holiday season in style though. Following the spirit of the season, it is also about giving back. They will also be donating a portion of the money raised to the Red Dirt Relief Fund which provides assistance to artists in difficult times when they may have no other resources. I promise you that you will be hard pressed to find a better time and this much talent together anywhere else this holiday season.